Different HRV units have different mounting options. Some are floor only, wall only or ceiling or all three. Some units like the Airflow DV145 that I purchased can be mounted on the floor or wall while smaller Airflow units can be mounted on the ceiling, floor or wall. One needs to make sure that there is space underneath for the condensing water outlet. If the unit is mounted on a wall make sure that vibrations do not interfere with noise sensitive rooms such as bedrooms. I mounted ours on a sound proof and isolated base and used other sound proof methods to isolate it from an adjacent room. In the early stages of the build the fresh air inlet and stale air duct positions were selected with a spacing of over 2 metres. If the supply and exhaust ducts are too close this can interfere with the correct operation of the HRV unit. This entailed finding an HRV unit that would be flexible in the options available to simplify the space required for the main ducts and keep the runs as short as possible. The lengths of the supply and exhaust ducts play a big factor in the efficiency of the whole system. The Airflow unit comes in a right hand and left hand model. I found that different manufacturers have different duct layouts even though they have Right Hand and Left Hand models. One can see from the above graph that with the winter sun I needed to switch of the heater and switch to summer bypass. 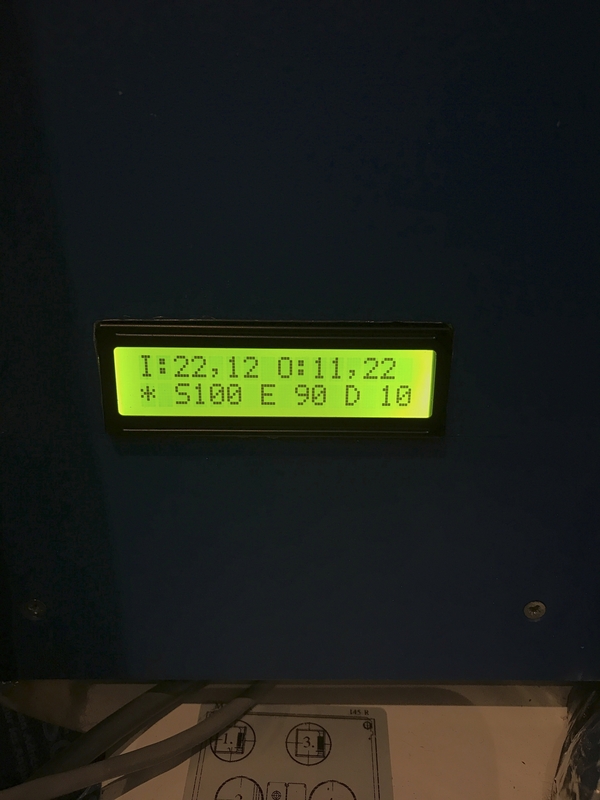 The next plan is to automate the bypass mode when the solar irradiance level measured in W/m2 and temperature exceed a set value then the HRV would automatically switch over to the summer bypass mode as one is gaining solar heat. As the internal fans are to the rear of the unit I added a small amount of soundproofing as an experiment. I was able to reduce the db level from 49 db to 44 db. Each 3 db approximately equates to twice as loud or twice as quite depending on whether you are increasing or decreasing the level. I mounted the unit in the hallway entrance so extra sound proofing was required. If one has a utility room then extra sound proofing would not be necessary I feel. 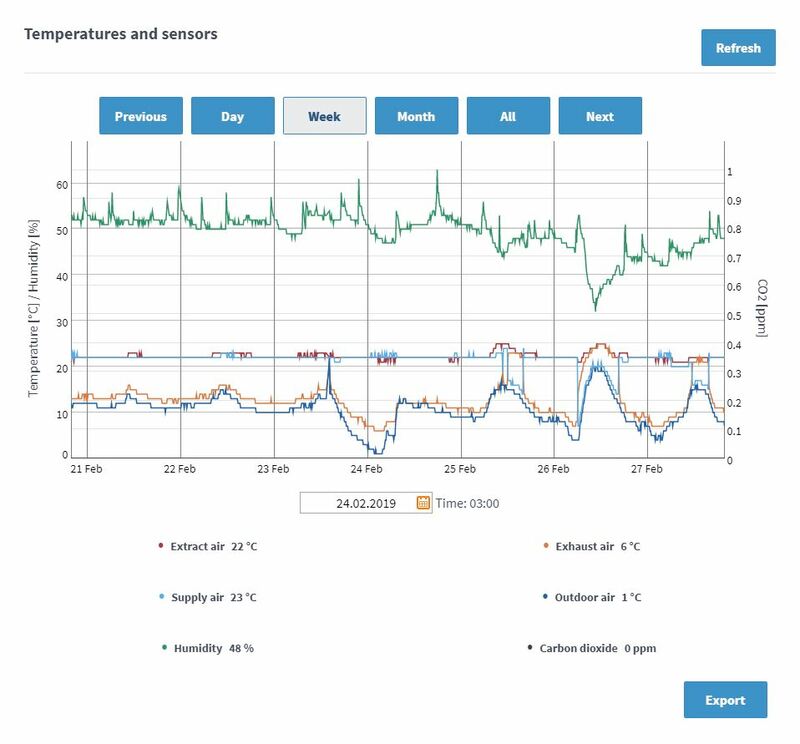 Following on from the previous blog I had a display panel built that calculates the HRV efficiency using the supply method and extract method by means of the Modbus data connection available in the HRV unit . In the Image below one can see S100 (Supply method for calculating efficiency) and the E 90 (Extract method ) as a percentage. The supply method is the one typically used by manufacturers in brochures. The D displays the difference . The top line displays the temperatures of the Inside air and the air leaving the house followed by the Outside air temperature and the supply air temperature to the house. When the post heater is on the efficiency calculated with the supply method sometimes displays a number greater than 100% as the heater is built into the unit and mounted before the thermostat. The extract method for calculating the efficiency is a closer representation of the real efficiency and it is similar to the passive house method (uses the same principle ). The extract method does not use the supply air temperature in the formulae. Access for repair and maintenance. Some HRV units require side panel access so ensure that you have enough space to get access to fans/ filters for cleaning and maintenance . The Airflow DV145 can be fully maintained from the front cover so it can be fitted in a corner space without restricting future access to internal parts. The filters are also maintained from the front panel. When selecting a unit- what was important to me that there was an integrated summer bypass function in the unit, software control by a smartphone with data capture (a manual control panel-is an extra cost and another item that could fail) and an integrated post electric heater. Airflow also sell a ground source heat pump option connection to the HRV which I did not purchase. For those installing a stove / fireplace one requires a Fireplace function built into the HRV . The Airflow DV145 has this function. Example of HRV in use in our home. The summer bypass function allows one to bypass the heat recovery function during warm weather or reduce winter sun peaks (when the sun is low on the horizon). The way this works is to bring the air outside directly through the ducts in order to reduce the internal temperature at night or during the day. 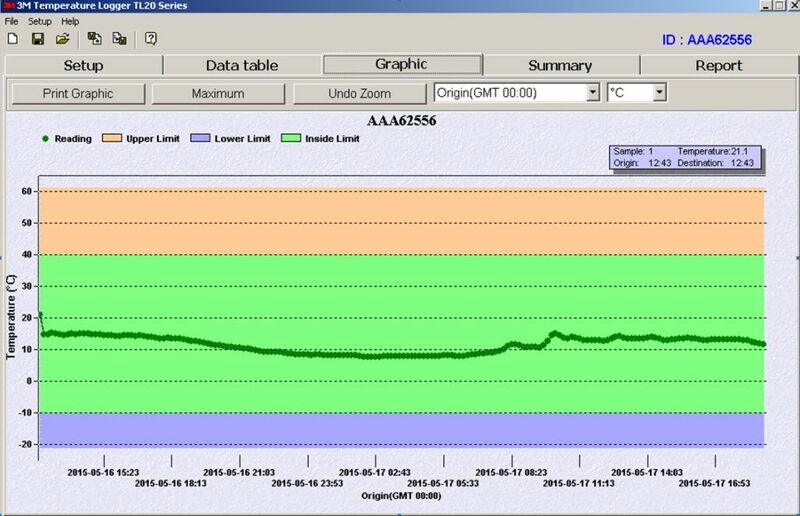 One can see from the image above on the 28 and 29th of September I forced the HRV unit to summer bypass during the day to keep the temperate under control with the winter sun. No heating had been switched on for the month of September and the night temperature outside has hit the lowest in the same month of 2 degrees. The Airflow unit is software controlled by means of your phone or your personal computer . This helps keep the HRV cost down, gives remote control and it provides data for analysis. The physical manual control panels in general cost €200 or more. The post heater in the Airflow DV145 unit has a PWM (pulse width modulation) heating element control which means that it can control the switching of the heater within a fine tolerance for heating the air rather than just switching the heater On and Off. The reason I installed this was really to provide a back up option to the main house heating system (approximately €200 extra). The house heating is currently designed around two storage heaters of 1.7 kw each to heat the house using off peak electricity and operate for 7 hours a day. I picked up one unit for free and the other unit cost €70. I suppose one could say that the total capital cost of the heating system was €270 when one adds the HRV post heater. For the month of October one of these heaters was switched on for 14 days. The post heater also improves the frost protection functionality within the HRV and helps maintain a heating level of 21 degrees Celsius throughout the house. Below is an example of how the HRV switches on different heating loads in the post heater while maintaining a set temperature . The time interval below is over 60 seconds (full screen view) and the heater appears to adjust the power output required continuously to maintain the set temperature. Post Heater being switched on and off approximately six times in a minute with different heating outputs. I selected an insulated 210mm EPS duct for the extract pipe as this duct carries the coldest air from the HRV unit . There are a number of options. My understanding is that the larger duct systems such as 150mm feeding multiple rooms with silencers is the best option if one can accommodate this in the build early on and find a good designer. I opted for the 91mm semi rigid ducts using a manifold system from https://www.fraenkische.com and I am very happy with the low noise level and amount of air being delivered throughout the house. 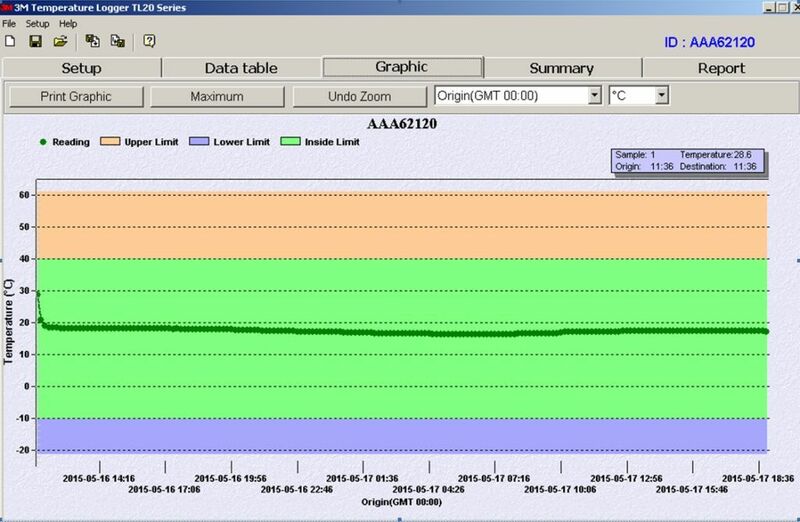 I use a co2 sensor to monitor how the flow rates are working in different rooms. When one is designing a house to the passive house standard or installing an HRV unit in an energy efficient /airtight house one can reduce the cost on the system if one plans the service routes of the ducts early on and selects particular joist types. It is expensive to batten and counter batten to hide the ducts afterwards as one needs to try and keep the duct-work within the airtight envelope. I opted for the manifold system using the largest semi rigid ducts I could find. These were the Fraenkische-profi-air classic pipe with an internal diameter of 78mm and outside diameter of 91mm. The larger the duct the lower the air friction and noise when delivering air to rooms such as bedrooms. These ducts are also anti-static and low emission. Below are the choices I came across from the semi rigid range. The white duct is made by Fraenkische. Connection ducts from Manifold to HRV. For the ducts that connect between the main HRV unit and the manifold I used an insulated flexible sound reducing duct (as seen below). This is made up of an inner foil with sound reducing properties, next an airtight plastic membrane and then insulation followed by another layer of foil. The inner rim is re-enforced with a steel wire to provide rigidity. It is time consuming connecting this up but it appears to have done its job. Selection of the HRV unit. For those building to the Passive House standard the HRV is independently tested by the Passive House Institute. They provide a full list of certified units at the following link Passive House Certified Heat Recovery Units. There are principally three methods it seems. One is the Supply method (used by manufactures) and this usually gives a higher efficiency value than the real world values. The Extract efficiency method is used to give a closer to real world value and then the passive house efficiency method which adds the following formulae to the Extract efficiency method. The good news is that it appears if the HRV is certified to the Passive House standard then the difference between the supply method and the extract method is very small. In the near future I plan to connect to the HRV unit I purchased and view the efficiency values. The most cost efficient unit I came across was the Airflow DV145 passive house certified unit for our 200 m2 house with an airflow capacity of 542 m3/h. I paid around €2200 for it. If one has a smaller floor area then more savings can be made by using a smaller unit. As a self builder technical support was important and their main offices are in the UK. If one opts for a non-certified HRV unit a 12% reduction must be applied to the manufacturers specification . Some manufacturers might not renew the certificate each year so it is a good idea to ask if a certificate exists. The data must be entered in the planning software for the passive house. For those interested in the passive house planning software (PHPP) there are courses run in Ireland frequently so I would suggest that one does this 3 day course (typical) and usually one finds the software discounted on the course. Self Build air tightness test -0.22ach with a volume of 603 m3 @ 50 pascals. When one is building to a performance standard the day of reckoning is the airtight test. The reason for this is that when one is pumping fresh air into the house using a Heat Recovery System, rather than relying on simple multiple holes in the wall, it becomes important to control where the fresh air is coming from and where the heat is going. If air is leaking in or out around windows /doors/walls or other gaps in the building fabric then heat is lost and moisture problems in the form of mould can arise or else give rise to damage to the building fabric. The pressure 50 pascals equates to a 20 mile per hour wind which is not too untypical in Ireland. So if one opts for the Irish building standard (a minimum standard) this equates to the air in the house changing/leaking 7 times a hour when a wind blows at 20 miles per hour. No wonder people block up the hole in the wall vents . The current Irish building standard require 7 air changes per hour (ach) also called leakage at 50 pascals typically with no heat recovery system. As a guidance heat recovery manufactures recommend 3 Air leakages per hour to ensure that the heat recovery system can push fresh air into the house and recover heat leaving the house through its own system rather than through gaps in the building fabric. The passive house standard for a new house requires 0.6 Air changes per hour (ach) at 50 pascals to ensure the heat recovery system works efficiently, ensure that occupants receive the correct amount of fresh air and minimise building fabric damage. The passive house test differs from the Irish test because it must include pressurisation and depressurisation and use the volume as set out per Vn50 (EN13829). Gavin O Shea from Greenbuild was hired for the job. He is certified/audited by the National Standards Authority of Ireland (NSAI). The preparation for this entailed sealing all cable ducts and the inlet and outlet pipes for the Heat Recovery System. One also ensures that the shower and sink outlet traps are full of water. The overflow outlet for two water tanks were not sealed off. I did consider a duck valve but it was not in place at the time of the test. Gavin O Shea calculated that the equivalent size hole that equates to a result of 0.22 ach is approximately 65.25 cm2 (@50Pa) or a hole 81mm x 81mm if all of the leaks present in the dwelling were concentrated into one hole. That is about a tenth of an A4 sheet of paper. The results of the air tight test can also help determine the selection of the Heat Recovery System. If the airtight test is lower then more options are available when selecting a unit. From my research a passive house standard Heat Recovery Unit will cost more because it needs to be independently tested by the Passive House Institute using their test method. Heat Recovery manufactures have also the burden of putting the unit through national tests or international tests with the end result being the customer pays more. One has also the option to select a non passive house certified unit for a passive house but when calculating the performance value one needs to account for this in the PHPP software with a 12% reduction below the manufacturers performance claim. If one wants to view certified Heat Recovery Units one can find and sort them at the following link. One can see for example at this link the capacity (Column- Air Flow Range) that these units have as it is important to select a unit that is oversized for your particular self build. I would compare it to selecting a mini car to tow a caravan up a hill compared to using a larger car. The small car will struggle from an efficiency and noise point of view while the larger car will be quieter and more efficient at the require flow rates. I will do a separate post on how I selected our Heat Recovery Unit. I decided to record the temperature inside and outside in order to get a feel for how the house performs before it is finished. I still need to install another 50 mm of insulation on most of the internal walls (2 of the 8 walls have the 50 mm insulation. Two windows are not sealed and all have no airtight membranes attached. I collected data over a similar time period to the above and the results were similar. The plan was to install another 100 mm of insulation on the internal walls but I have now decided to not do this based on the results above and adjustment of the PHPP (passive house planning package) software. I feel I have left enough of a safety margin in the PHPP to still attain the passive house standard. For example I left the ground level door and window installation thermal bridge psi values at the PHPP default . Installing the extra insulation would cost €1500 and the wooden frame to hold it in place would have added another €2000 approximately (Savings €3500) . I also reviewed the ceiling voids as I had planned to allow a 100 mm service cavity for the HRV ductwork. This was on reflection going to cost an extra €3500 approximately but now I will be able to hide the ducts using a simpler localised approach (Saved another €3500). It is nice to be in a position to review the costs at the pace of our self build. I am now researching an economical building performance monitoring and control system that will record and display data over a longer period of time and allow me to control certain functions such as entrance gates, lighting etc . I have read that the actual performance of houses being built whether passive or standard do not always perform the way they were supposed to. I feel the only way to monitor this is to have an economical simple system (easy to use ) that watches for failures and highlights issues during the life of the build. When one reduces the energy levels to a very low level finding problems before they increase cost is a must. For example on a recent school project the storage heating contactor went faulty in the closed position which meant the storage heating was on day and night. One had to wait for the next ESB bill to find there was a problem. I note that the american PHIUS (passive house breakaway group) which is the equivalent of the passive house institute in Germany have co-developed a building Monitoring solution starting at $800 with powerwisesystems.com . I feel this is still too expensive. Lets see what my research turns up. Inside and Outside Temperature with scaffolding still in place-Image Below. The passive house software allows one to set your own performance standard by selecting how much energy (oil/gas/electricity) one wants to use to heat the building. For example current Irish house builds that comply with today’s standard 2014 are estimated to use 100watts per m2 (subjective). The passive house standard if one goes for certification uses 10w per m2 (objective). The real benefit for using the PHPP software is that the performance approach can be set by the home user. For example if I want to reduce my energy consumption to 1.5 litres of oil per m2 of the house size then I can set the software to a maximum of 15kwh per m2 for the year while maintaining a temperature of 20 degrees Celsius. In a typical 3 bedroom house with an area of 100m2 the oil usage would be 150 litres a year. With the PHPP performance software one can set the number of litres of oil (or gas etc) per year that your residential or commercial property will use to within a small margin of error. In other words you select the performance value of your build. 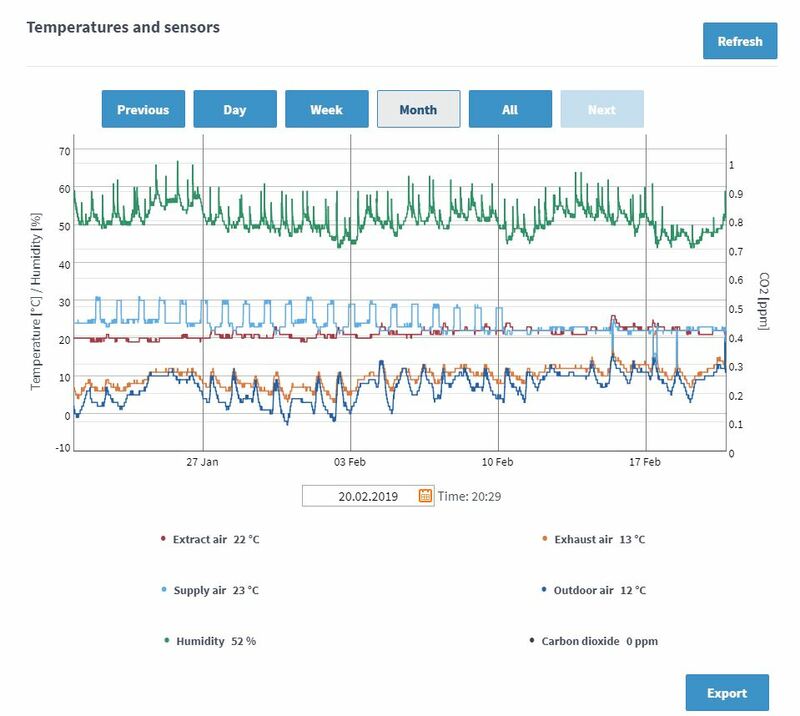 In summary the PHPP software takes into account your comfort and health (temperature and oxygen levels) by removing high CO2 levels and VOCs and providing an even temperature throughout the house. This site/blog is the experience of deciding to build a house to a performance standard using the Passive House Planning Software called PHPP. It is also an objective to comply with the Irish Statutory Rating System (BER). The other tools used to build the house which are also performance oriented are Thermal Bridging Software and Hygrothermal Analysis Software.